Friends and family in the Río Abajo turn a harvest tradition into an epic annual event. It’s matanza time! 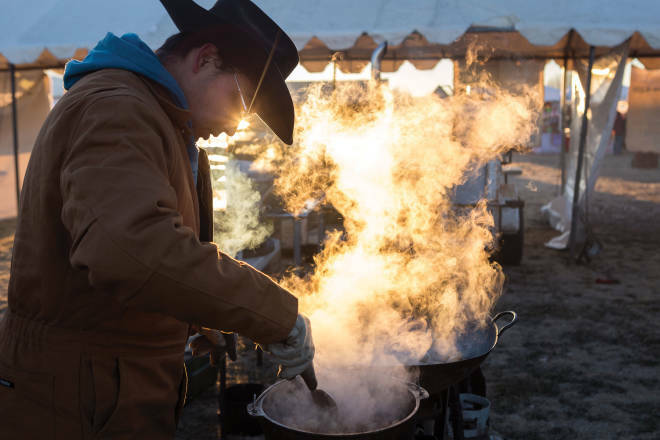 Above: Dawn breaks as a contestant stirs his carne adovada. INSIDE THE JUDGES&apos; TENT, the water bottles have frozen, and so has the ink in our pens. A volunteer sees me struggling to write and hands me a chubby permanent marker to rate the latest sample of carne adovada on its presentation, taste, and texture. My experienced ruling? It’s freaking amazing! Ten. Ten. Ten! It’s late January in Belén, about 30 miles south of Albuquerque, the weekend before the Super Bowl. Eighteen teams have set up on the broad, flat field of Eagle Park, competing for fame, glory, and engraved plaques shaped like pigs at the 17th annual World’s Largest Matanza—a traditional pig roast writ large. Groups of friends and co-workers have signed up to cook whole hogs the way their families have for hundreds of years, each betting that their adovada, chicharrónes, and chile are the best. Cooks have spent the year perfecting recipes for bizcochitos and practicing their tortilla-rolling skills, one eye warily sizing up the stiff competition. Although the sun is rising in a clear sky, it’s early still, and a cold snap holds the temperature below freezing. I had been loitering around the judges’ tent, waiting to talk to one of the event organizers, when I overheard someone say they were short of judges. Oho! Five minutes later I had talked my way into one of the empty slots. Now local luminaries are starting to filter in, and I run into a politician I know from my days as a beat reporter. Probably grateful to find that I’m just here for the food, he happily delivers a paean to the virtues of chile from the Río Abajo. That’s the Spanish name for the stretch of the Río Grande south of Santa Fe (north of which is the Río Arriba). But what he’s really talking about is the middle part of the state, that swath between Albuquerque and Socorro, where a wide ribbon of the Río Grande links Los Lunas and Belén with the hamlets of Peralta, Veguita, La Joya, and Lemitar. I bite into my second sample of carne adovada, a glistening cube of tender pork that’s been simmered in bright red chile, and nod my head enthusiastically at the politician’s chile speech, thinking: He has reason to be proud. It’s almost impossible to pick a favorite, but I do my best before another set of judges moves in. Reluctantly, with a forlorn glance at the hot, puffy tortillas being prepped for the next round, I’m ushered out of the tent and into the bright winter sun. THE MATANZA HAS BEEN a part of New Mexico’s culinary culture since the Spanish first introduced pigs to the Río Grande Valley. In the days before refrigeration, the slaughter of a fattened hog during fall and winter was a community celebration—and a practical way to distribute food among family and friends. Cooking a whole pig is a big job and, by nature, a social event. You need strong arms to dig a deep pit and plenty of firewood to craft a deep bed of coals. In 500 years, the general process hasn’t changed that much. You give thanks for the animal’s sacrifice, then cut up all of the fat and put it in a big iron or copper cazo (a type of pot) to simmer for hours. Everyone clamors for chicharrónes, little pieces of fatty meat cooked to crispy perfection. Tortillas are rolled out and put on heated comals to puff, while bigger pieces of pork immersed in red chile slowly simmer. Still, a matanza is a celebration to savor. Participants revel in the opportunity to dust off their cauldrons and taste the foods of their childhoods. It’s the only major event put on by the Valencia County Hispano Chamber of Commerce, which turns the ticket proceeds into scholarships for local students, and its success is a major point of pride. Lately there’s been talk about spreading the idea to other parts of the state, maybe turning the World’s Largest Matanza into a kind of playoff for winners of the smaller contests. The Pig League, if you will. OUTSIDE THE JUDGES&apos; TENT, the day has grown warmer. A ranchera band tunes up on the stage. Vendors do a brisk business in T-shirts and tchotchkes. Clouds of steam billow from the cazos. Brawny men stir the contents with wooden sticks as tall as first graders. Vinyl banners identify cooking teams that include co-workers from Los Lunas Schools, the Rio Grande Estates Fire Department, and Randy’s Electric. Siblings, husbands, and wives anchor other crews, but all are anxiously aware that it’s not just the official judges they have to worry about. Thousands of hungry people have arrived by car, by Rail Runner, by bike, and on foot. Now they’re descending on the tables to make the most of $15 tickets that entitle them to free tastes—and the right to vote in the People’s Choice category. A waft of fried pork turns my head to the line of booths where competitors dole out samples. These folks have been up since dawn, digging pits, lighting fires, and preparing to cook two whole hogs apiece. The gates opened at 7 a.m., and prime eating time is earlier than you think, about 10:30 a.m. Arrive later than that and you’ll miss all the good stuff. Like a bowl of big, crunchy chicharrónes in red chile that sends me over the edge. Everything goes quiet and dark as I become completely drunk on fried pork. I open my eyes. It’s 11 a.m. I’ve eaten an embarrassing amount of chicharrónes, and one stand is already out of food. In the beer garden, I meet a group of women who live in Albuquerque and always come to the matanza together. Laurie Griego says she remembers lots of matanzas in her childhood, but things changed when her parents died. The tradition just sort of petered out, she says. Her niece, Paula Gutierrez, says that’s why they always come to Belén for this event. “It’s a tradition—and it’s a party!” she says, hoisting her Bud Light and tapping it to mine. I tell them I’ll see them here next year as I waddle off in search of a bizcochito. Even the most adventurous cook may find the notion of cooking a whole hog too daunting. Visitors to the World’s Largest Matanza, in Belén, get all the joys of a pig roast—carne adovada, crispy chicharrónes, fiery red chile, and puffy sopaipillas—without having to rise at dawn and stand over a smoky pit and a bubbling cauldron. With these recipes, you can DIY a mini-matanza at home. For many people, these meaty, fatty, crispy bits of pork top a matanza’s highlights. Cooks fry up the little morsels while the rest of the meat roasts. Dipped in red chile, they make a delightful snack. If you’re not cooking a whole hog, you can use pork belly to make this at home. You could fry the pork cubes in commercial lard, but they taste better if you take the time to cook them in their own fat, as described here. Cut the pork into - to -inch cubes. In a wide, shallow pan, combine the pork and enough water to cover. Bring the water to a boil and reduce to a gentle simmer. Cook until all the water has evaporated and what’s left is just pork cubes and rendered fat, about 3 hours. Turn the heat to high and fry the pork cubes until golden brown and crispy, 3–5 minutes. Drain the chicharrónes briefly on paper towels and serve hot, with plenty of red chile sauce. Simple sauces like this are a mainstay of every matanza. Dip a freshly fried chicharrón into a bowl of it. Experience bliss. Toast dried whole chile pods in a heavy skillet over medium heat until they are warm and release their fragrance, 1–2 minutes per side. Remove chiles from the skillet immediately. When cool enough to handle, break each pod into several pieces (wearing rubber or plastic gloves if your skin is sensitive). Discard stems and seeds. Warm the oil in a large saucepan over medium heat. Add onion and garlic. Sauté several minutes, until onion is limp. Place the chile pieces, onion, garlic, and oregano in a blender and pour in the water or stock. Puree until mostly smooth, with a few flecks of chile still visible. Pour chile mixture into a saucepan, then add salt. Reduce heat to medium-low and simmer. After about 15 minutes, taste the sauce and adjust seasonings. Continue simmering, for a total of 20–25 minutes. When ready, sauce will be cooked down enough to coat a spoon thickly but still drop off it easily. Use warm or refrigerate for later use. Complement a meat-heavy menu with ears of fresh corn that pick up a hint of smokiness on the grill. This recipe is inspired by the classic Mexican street snack in which a slathering of crema or mayonnaise helps adhere crumbles of salty, crumbly cotija cheese. Our version calls for New Mexico feta, which is very similar. Preheat a gas or charcoal grill. Grill the corn over high heat, 5–8 minutes, until it is cooked through and slightly charred. Slather the hot corn with crema, mayonnaise, or sour cream, then sprinkle with cheese, cilantro, and chile powder. Add lime and salt to taste. Golden fried pillows of dough are perfect for sopping up extra red chile or just drizzling with honey. Elevate that hot sopaipilla into a haute dessert by stuffing it with honey pecan ice cream. Stir together flours, salt, baking powder, and sugar in a large bowl. Work in oil, using clean fingers to combine. Add milk and water, working the liquids into the flour mixture until a sticky dough forms. Pour in a bit more water if the dough doesn’t stick together as a rough, shaggy ball. Vigorously knead the dough on a lightly floured surface for 1 minute. The dough should be soft but a bit sturdy and no longer sticky. Let dough rest, covered with a damp cloth, for 15 minutes. Divide it into 3 balls, cover them with a damp cloth, and let them rest for another 15–30 minutes. Roll each ball on a lightly floured surface into a circle or rectangle approximately -inch thick. If you have a tortilla roller, use it rather than a heavier rolling pin, which compacts the dough. Trim off ragged edges and discard them. (Rerolling the dough toughens it.) Cut each portion into 4 wedges or rectangles. Heat at least 3 inches of oil in a heavy, high-sided saucepan or skillet to 400°. Slip 1 or 2 pieces of dough into the oil. After sinking briefly, the sopaipillas should begin to balloon and rise back to the surface. Once they bob to the top, carefully spoon oil over them for the few seconds it takes to fully puff. Turn them over with a long-handled slotted spoon and cook until golden. Drain on paper towels. Stuff the hot sopaipillas with ice cream and serve immediately. A slight saltiness highlights the sweetness of the honey in this ice cream. You can add a teaspoon of ground cinnamon if you like—whisk it in with the yolks. In a medium saucepan over medium heat, combine milk, cream, and honey. Bring to a simmer. Meanwhile, whisk egg yolks and salt in a mixing bowl. Remove milk mixture from heat. Whisking the eggs constantly, use a ladle to add about 1 cup of the hot milk to them, a little at a time. This tempers the eggs so they don’t curdle. Pour egg mixture into the saucepan. Cook over low heat, stirring with a spatula, 5–8 minutes, until mixture thickens and coats the back of a spoon. Remove the custard from the heat, pour it into a bowl, and refrigerate until completely cool. Process the custard in an ice cream maker according to manufacturer’s instructions. About 2 minutes before the ice cream is done, add the pecans. Scrape the ice cream into a sealable container and freeze for 2 hours.